On the 1st, Hanwha Life Esports defeated Jin Air Greenwings 2-0. The first game started out strong for Jin Air. Grabbing the first 4 kills, the early to mid game was secured by Jin Air. However through Sangyoon’s Vladimir scaling, Hanwha was able to out teamfight Jin Air and close out game 1. In game 2, Hanwha did not give Jin Air the opportunity to replicate their early game success from game 1. Starting from the early 3 man top dive to grabbing Rift Herald, Hanwha gained momentum and did not let it go to waste. 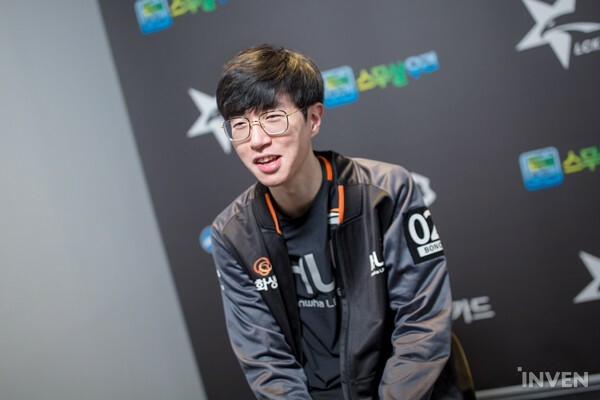 After the game, we got to interview Hanwha’s jungler, bonO. We were on a 2 game loss streak. Thanks to the win today, we were able to break the loss streak. I’m relieved and happy about our results today. ¤ As a jungler, you make plays and roam around with a variety of laners. Which position do you prefer roaming with? Hmm...If I had to choose a position, I would choose mid. I think mid is the best combination as a jungler to roam with. ¤ If you had to pick a specific player, who would you pick? Uhm...I don’t think I should say (laughs). I believe I would cho- actually...yeah...I shouldn’t say it (laughs). ¤ In game 1, Jin Air was ahead in the early game. In game 2, this did not happen. What changed? In the first game, our bot lane got double killed. Because of this, we started the game at a very disadvantageous position. The reason why we took so long and won in the late game is due to our team comp. In regards to the second game, we did receive and implement the feedback we received from our coach. Our coach told us that we should be more aggressive and decisive. To quickly gain a lead and never let it go. ¤ Was the difficulty in the first game due to Vladimir bot lane as a pick or another issue? Vladimir is a fairly weak champion in the early game and before level 6. He really needs a lot of time to really pop off. We knew it was going to be not the easiest lane, but we never expected the aggression that came from Jin Air. ¤ Many LCK teams have 8-10 man rosters. As a jungler, what is it like playing with different laners? First of, with a full 10 man roster, you actually have the option to do custom scrims within your team. That’s nice. For me personally, I get to talk with a variety of players like Moojin to gain as much in-game insight as possible. You also get a sense of competition inside your team. It helps us work harder and stay focused. ¤ Your next game is against SKT. How will you prepare and are you feeling confident? I know for a fact that if we win against SKT, I can rest easy (laughs). I really want us to win. We will play and practice like we always have to prepare for our next game against SKT T1. We won’t be intimidated by them. We will win.